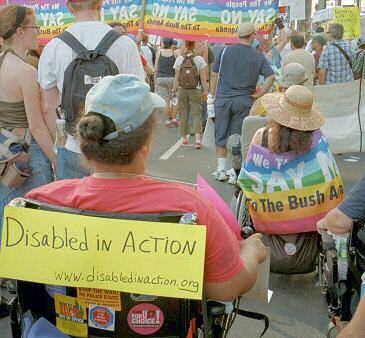 Disabled protesters in wheelchairs roll along the protest route. 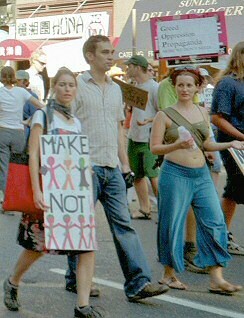 There were all kinds of people marching and it was sometimes hard to figure what they were protesting. Here's a woman in a belly-dancing outfit, perhaps representing "Belly Dancers Against Bush". Looking north up 5th Avenue as the marchers head south. 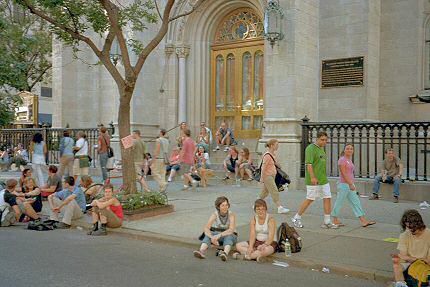 Heading down 5th Avenue, we passed a large church with an ornate entrance; a few people stopped to rest. Immediately after passing Madison Square Garden, the march turned right on 34th Street and speeded up, thinning out in the process. We made rapid progress, and after walking cross-town for two blocks (walking right past Macy's), we turned right and headed south on 5th Avenue. At the corner of 34th and 5th, we passed the Empire State Building, one of the architectural icons of New York City. I managed to get a rather nice picture looking up from the base of the building (the picture is on the next page). 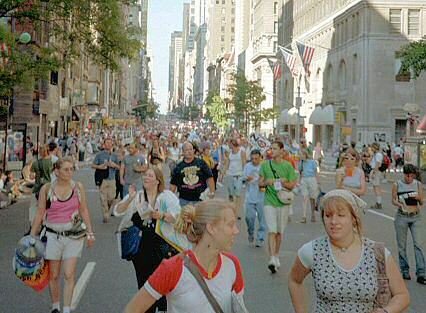 Later on near 23rd Street, 5th Avenue intersects with Broadway and we continued walking south on Broadway. I got a nice picture of the Flatiron Building, another architectural landmark in the city (also on the next page). Along the route, I passed a group of protesters towing a cart loaded with newspapers and festooned with banners. It turns out they were socialists and anarchists who were advocating a revolution to overthrow the government. Once, in our nation's distant past, we found revolution to be necessary, and from time to time the thought has occurred to me that we'll probably need another revolution at some point in the future. It's one thing to think about the concept of a revolution, but it's another thing entirely to see actual revolutionaries striving to make it happen. Up close and in-person, revolution is not very pretty. It's noisy and strident and you'll get your hands dirty and make some enemies. Here and there in the crowd you could spot some freaks, wild-looking people who were exuberantly caught up in the moment (though it was hard to discern their message, if any). I saw some aging hippies with long graying hair who had obviously been around the block a few times. They looked like the kind of people who would have been heavily involved in the anti-war protests of the late 60's. Most of the ones I saw today were just walking along rather slowly and quietly. They seem to have passed the protest torch to a new generation. I saw a group of people dressed as weird-looking nuns, looking a little like court jesters, too, carrying signs saying "Thou shalt not lie!" written in a heavy gothic font. As I walked down 5th Avenue, I also saw a scantily-clad young woman dancing around in the street sing-songing "My bush is on fire!". Although the above examples might seem rather extreme, it demonstrates one of the best things about New York City: its rock-solid belief in freedom of speech and its tolerance of widely differing viewpoints and methods of expression. After all, the city is an amalgam of millions of different people, each of whom has a unique point of view. The city does a magnificent job of accommodating everyone, if only to keep from exploding at the seams! As we walked downtown in the late afternoon, we finally got to enjoy a little shade from the buildings. For most of the day it had been sunny and hot, and I drank up all my tepid water. Many of the stores along the route were open for business, so I stopped at a CVS drugstore and bought a cold soda. In two places along the route, the group that organized the march had volunteers standing in the street politely soliciting contributions. They held big white plastic sacks, and passers-by would toss in coins or bills. Although I had already donated online using PayPal, I chipped in a couple more bucks just to feel good about it.